This fixed boundary parking post is designed to clearly mark the boundaries of a parking area and to protect buildings from accidental damage by cars. Available in a yellow powder coated or galvanised finish, these posts are highly visible and will help drivers establish the boundaries of a parking area while also helping business and land owners mark the boundaries of their property and ensure that their buildings and belongings remain safe. 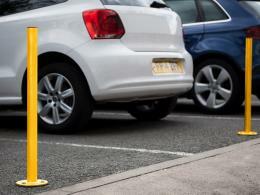 This parking post is designed for outdoor use and is bolted down on to your desired surface. The sturdy finish of these posts ensures that they will stand up to all of the wear and tear the parking environment has to offer while the 750 mm height and 50 mm diameter ensures that drivers will be able to see these posts easily and quickly. Driveway bollards are a simple way to assist drivers in spacial awareness. These fixed boundary parking posts are available for free next day delivery and are equipped with a 1-year warranty on parts and labour. 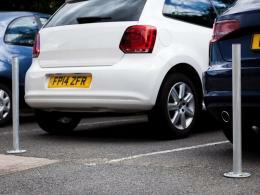 At The Workplace Depot there is a wide variety of fixed and removable parking posts. Removable bollards and telescopic bollards are simple, versatile products to accommodate car parks with specific requirements.